Despite the accusations made by progressive feminists, the Church has no position on the identity of Mary of Magdalene. Although she is a very important figure in the Gospels, we know little about her. From the Gospels, we know that she had been exorcised of seven demons from Luke’s Gospel (8:1-2), and every Gospel identifies her as one of the women at the foot of the Cross. She was also the first to discover the empty tomb and to encounter the risen Christ; and she is the one who announced to the to the Apostles, “I have seen the Lord” (Jn.20:18). The Church is often accused of demonizing Mary of Magdalene as a prostitute. This is absolutely false. 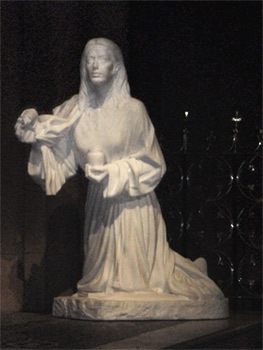 It is true that some Church Fathers speculated that she may be the women with the alabaster jar, who appears in all four Gospels, as the women who anointed the feet of Christ with expensive oil (Mt. 26:6-13;Mk14:1-2;Lk. 22:1-2;Jn.47:36-38). This woman is identified as a great sinner. This means that she would have been an outcast in the ancient Jewish community. That is why those in attendance were scandalized that Jesus let her near him. In that community those who committed certain grave sins, like being a tax collector as was Matthew, were permanently excommunicated from Jewish life. There was no redemption. Yet Jesus repeatedly forgives the sinner. He even chose Matthew, a tax collector, to be one of the twelve. Mary Magdalene, therefore, is a most excellent disciple and a figure of hope. The Church, from the earliest of times, has venerated her. The focus has always been on her conversion and redemption and not on her sinfulness. She is widely represented in art throughout the middle ages. Mary inspired many of the Saints to persevere in holiness. She is a great Saint, and she is known as the Apostle to the Apostles. There have been distortions of her story throughout the history of Christianity. The latest is the fiction of Dan Brown (The Davinci Code) which he has claimed is based on historical fact. In his fiction, Jesus faked his death, ran away with Mary, and they married.Yeah right. It is (snark) absolutely plausible that most of the Apostles and many of the early Christians died for a lie and a man who ran off with the babe. If that were true, I could revert to my former ways and sleep in on Sunday. Here is an excellent article from a surprising source the progressive National Catholic Reporter. Excerpt:“ Catholic and other Christian women have seen these roles as making Mary Magdalene a unique apostle, the apostle to the apostles. They have assumed that a patriarchal hierarchy, shortly after the death of Jesus, falsified her identity In order to remove her as a “role model” for w omen’s ministry. “When Mary Magdalene came to the tomb and did not find the Lord’s body, she thought it had been taken away and so informed the disciples. After they came and saw the tomb, they too believed what Mary had told them. The text then says: The disciples went back home, and it adds: but Mary wept and remained standing outside the tomb. This entry was posted in Saints and tagged Catholic Saints, Church, Church contraversy, Dan Brown, Feminist theology. Bookmark the permalink.